Photo by makelessnoise via Creative Commons/Flickr. Easter is coming soon and so is the annual Jefferson Community Center Spring Egg Hunt and Pancake Breakfast on Saturday, March 30. The egg hunt will start at 10 a.m. sharp. The pancake breakfast will be served from 9 to 11 a.m.
Pancakes are $4, pancakes and sausage are $5, and the deluxe breakfast with pancakes, sausage and eggs will be $6. The egg hunt is free. Jefferson Community Center is located at 3801 Beacon Ave. S. For more information, call 206-684-7481. Photo by makelessnoise via Flickr/Creative Commons. 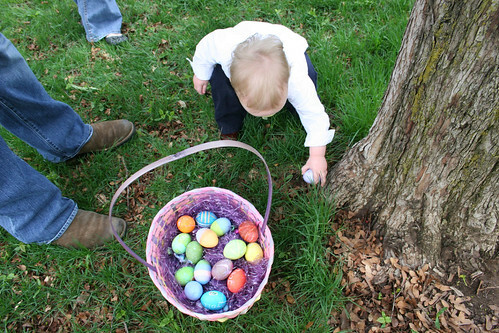 This weekend brings several egg hunt events at Beacon Hill and nearby community centers. At Jefferson Community Center (3801 Beacon Ave. S.), Friday, April 6 at 8 p.m., there is a Teen Flashlight Egg Hunt for those 12 and older. The event is free, but bring a flashlight and a bag. Meet at the community center gym at 8 sharp. The hunt will be outdoors. 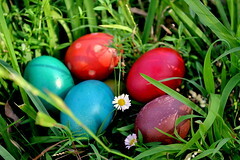 Saturday, April 7, is the Spring Egg Hunt and Pancake Breakfast. Breakfast will be served from 9-11 a.m., and the Egg Hunt starts at 10 a.m. sharp. The Egg Hunt is free, but breakfast is not: $4 for pancakes, $5 for pancakes and sausage, or $6 for pancakes, sausage and eggs. The Van Asselt Community Center is also holding a Spring Egg Hunt and Pancake Breakfast Saturday from 10-11:30 a.m. The egg hunt for kids aged 2-8 is free and starts at 10 sharp, and the pancake breakfast will follow the egg hunt. The breakfast is $3 per person for all-you-can-eat pancakes with syrup, butter, and juice. Down the hill, both the International District/Chinatown and Rainier community center are also holding free egg hunts Saturday morning at 10 a.m. (April 7) for kids under 11. The International District/Chinatown Community Center is located at 719 8th Ave. S. The Rainier Community Center is at 4600 38th Ave. S.
Photo by jamieanne, via Creative Commons. It’s that time of year—time to go egg hunting! The springtime festivities start tonight with two teens-only free Flashlight Egg Hunts at Jefferson and Van Asselt Community Centers. Bring your own flashlight and goodie bag to hunt for prize eggs that contain candy and games. The hunts are rain-or-shine, so dress appropriately if it rains. Tomorrow, everyone is invited to Jefferson Community Center for the Spring Egg Hunt and Pancake Social, from 9 a.m. until noon. Children 10 and under should bring a basket or a bag to collect treats at the egg hunt. Pancakes are available for all ages before the egg hunt, so be there early. The egg hunt is free. The cost for pancakes is $3, pancakes and sausage are $4, and the whole shebang—pancakes, sausage, and eggs—is $5. Jefferson Community Center is located at 3801 Beacon Ave. S.
This coming Saturday, April 3rd, the Hilltop Red Apple is having their “1st Annual” Easter Egg Hunt at 9am. Stop by the store at Beacon and Lander across from the light rail station or call 206-323-1325 for more details. Bring a basket or a bag to gather up goodies at our Spring Egg Hunt! All children 10 years of age and younger are welcomed to the hunt. Come rain or shine! A pancake breakfast will follow the egg hunt. The cost is $1 per person or $5 per family. Jefferson Community Center is located at 3801 Beacon Ave S and Van Asselt Community Center is located at 2820 S Myrtle St.